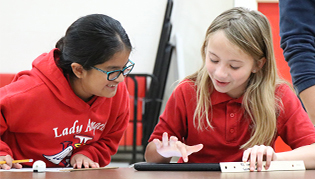 An accreditation team visited the Incarnate Word Academy campus from March 24-27, 2015. The accreditation process is repeated every seven years and helps schools identify what we are doing well and ensures that we continue to make improvements where we can. This process also guarantees that IWA constantly strives for excellence and continues to deliver a high standard of academic success, and support the faith formation of our students. 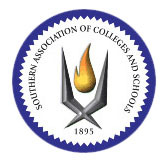 As a result of its strong academic performance and demonstrated dedication to the faith community, Incarnate Word Academy is accredited by the Southern Association of Colleges and Schools, AdvancEd, and the Texas Education Agency through the Accreditation Commission of the Texas Catholic Conference Education Department. IWA is also a member of the National Catholic Educational Association, which provides additional leadership, direction, and service to initiatives. The Mission of the school permeates every facet of the educational community. Support groups in the community directly connect with the school as a reflection of the Mission. The School Board, President's Circle and Parent Teacher Organization devote their efforts and activities to the enhancement of the school in ways that benefit the students. 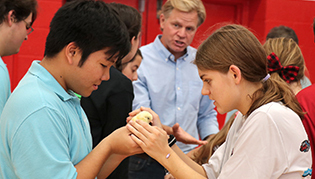 The school’s commitment to its Catholic identity is clearly and vibrantly evident, especially through the many opportunities for spiritual growth and the mutual respect, care and compassion exhibited by the entire school community. 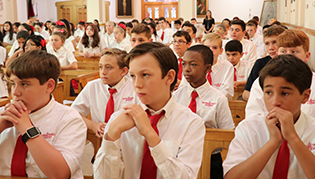 The school community has established a clear expectation for academic excellence and has succeeded in communicating that expectation to students and the parents/guardians. The realization of this expectation is evidenced by the collegiate success of Incarnate Word Academy High School graduates. The administrative team and faculty/staff have worked diligently to align the curriculum. The school provides a safe environment, utilizing a variety of security measures.